What are some of the differences between MMD and MMM? 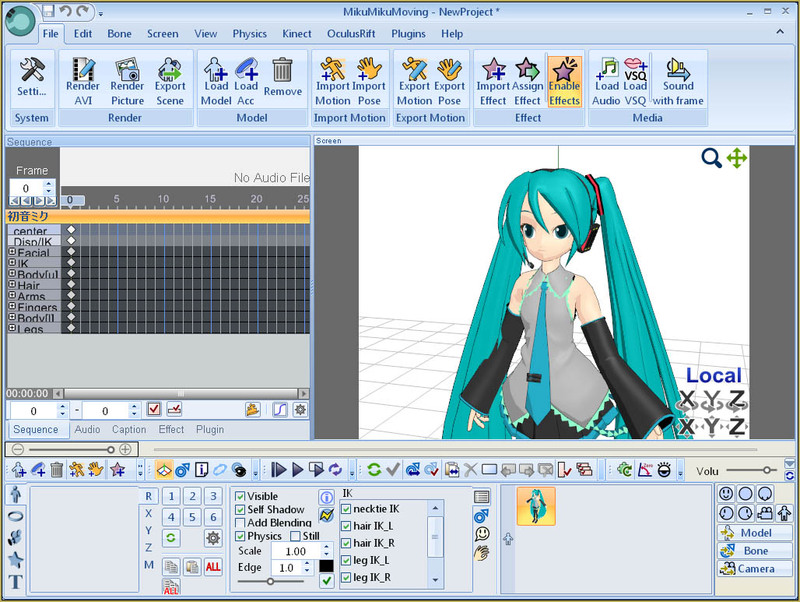 Is MikuMikuMoving different from MikuMikuDance? Is MMD better than MMM or is MMM Better? 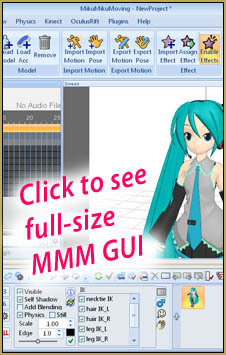 I discovered MMD and MMM while looking for anime models for Daz Studio, a free 3D animation program. I had dreams of making an animated movie with my laptop. Unfortunately, my laptop proved to be unequal to the challenge. I was able to make very short simple animations of multiple models or longer animations of fewer objects, but project files that I saved would not reload, and without the ability to save the program would crash without warning and I would lose all of my work! This was very discouraging and I resigned myself to learning as much as I could about key frame animation. I found some MMD models online, and that led me to the LearnMMD site where I discovered the links and downloaded MMD and MMM. I rendered the All Star sample that came with MMD and was totally blown away! So many models, effects, lighting, shadows, and physics… and it all rendered in less than 10 minutes! Suddenly, my dream of making an animated movie was alive again! In the series of articles I am writing, I hope to share my experiences learning both programs… I have found that if I can’t figure out how to accomplish something with MMM, I can usually find a relevant tutorial for MMD and apply the methods to MMM. I really prefer the interface to MMM and I will be describing it in more detail in my next article. For now, I just want to describe some of the differences in these 2 fine programs. Please keep in mind that I’m still a newbie with both of these programs, so be sure and check the comments for corrections! One of the first differences you will notice about MMM (as compared to MMD) is the Settings button in the upper left corner of the interface. Clicking this button opens the Settings dialog box with 3 tabs… Screen, Editor, and System (Fig1). The first option on the Screen tab lets you set the maximum FPS that the program will attempt to display when you hit the Play button. Next is the default screen size, which can be changed at render time. Next is an option called Clip which lets you set values for Near Plane and Far Plane (I don’t really know what this is for). Next you can set the Selfshadow buffer size, which I’m assuming can be tweaked for performance. 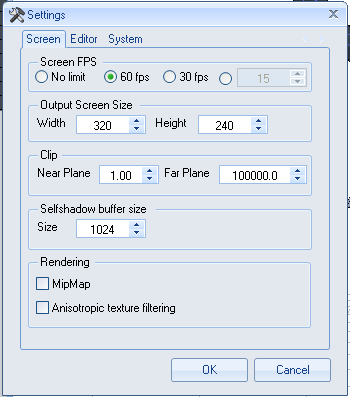 You then have Rendering options for MipMap and Anisotropic texture filtering (which are also mysteries to me). 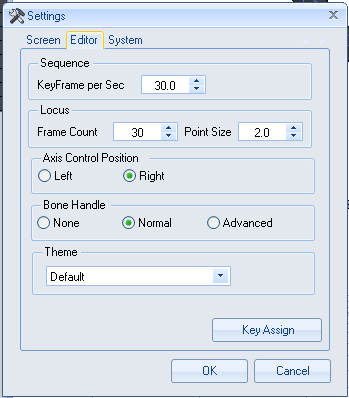 The Editor section (Fig2) has a Sequence section which sets the key frames per second and a Locus section which sets frame count and Point size. 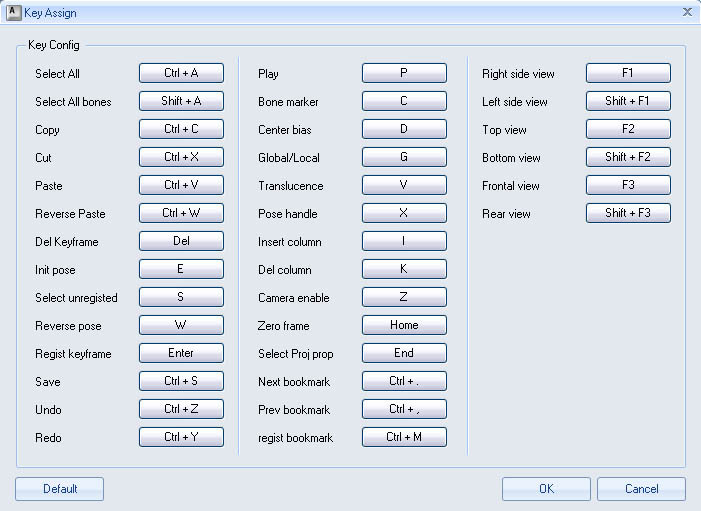 Next is the Axis Control Position which allows you to have the axis controls (XYZ) on the left or right. There is a Bone Handle option with None, Normal, and Advanced settings (I haven’t played with these yet). Then there’s a Theme setting that lets you choose between the Blue toned default and a gray toned interface (it does not change the screen layout). A neat feature is the key assign button which lets you view and assign keyboard assignments (Fig3). 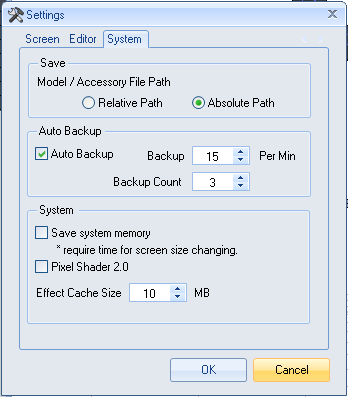 The System tab (Fig4) lets you choose between relative and absolute paths for models and accessories and set Auto backup options (minutes between backups and backup count). There is an option to save system memory for those of us who do not have supercomputers. There is also an option for Pixel Shader 2.0 which I don’t understand and an effect cache size option which I can’t play with because apparently my hardware doesn’t support effects :( All of these options can probably be set in MMD, but with MMM you can set the defaults. Other differences I have noticed is that MMD always tries to load models, accessories, motions, poses, and wav files from within it’s own directory while MMM ‘remembers’ where you last loaded from and takes you there. MMD’s PMMs don’t open in MMM! Unfortunately the project files for MMM and MMD are incompatible, but the models, accessories, motions, and pose file formats work identical on both programs as far as I can tell. MMM can load .mp3 and .wav soundtracks where MMD can only do .wav files. Dummy bones don’t seem to be needed in MMM. With MMD, if you move the position of an accessory without a dummy bone and register, the accessory remains in its original position until the key frame is reached and then jumps to the new position with no tween frames generated. Moving accessories with MMM is identical to moving models and tween frames are generated automatically. Well, I guess that’s about all for now. All you MMD’ers out there, don’t be afraid to download MMM and give it a try… you just might like it! Which one is better? MMD or MMM? It’s a matter of taste. MMM tries to be more advanced than MMD, with more familiar Office-like interface, DirectX 11 support, “soft bodies” physics (MMD only supports rigid bodies) and some other features that MMD lacks. The problem with it is, though, that it only can run a small host of MMM-adjusted effects, while hundreds of existing MME effects for MMD have limited or no compatibility. That, for me, was a deciding factor. That, and tons of tutorials. MMM will have to put a *lot* of effort into becoming better than MMD before it persuades MMD’s fanbase to leave their zone of comfort. In MMD, there is a ‘gravity’ option whereby one can tweak the direction and speed(?) of the physics. Is this feature also available (or in development?) for MMM?